If this concept confounds even the infinity scholars among us, how could it possibly be an appropriate subject for a picture book? One of the many contradictions inherent in infinity is that we have a burning desire to master this concept because we sense that the task is impossible. This desire often seems to be strongest in childhood. Let’s face it, that moment when we first realize that we will never get to the biggest number, or never reach the edge of the universe is terrifying. Children get a glimpse of the unknowable, and are then burdened with the knowledge that they will never be able to solve this problem fully. Why is this question so important to them? Because it is the essential existential question; if something infinitely big exists, how does that affect me and my place in the universe? As adults, this question persists, even though many of us tune it out for periods of time before it bubbles to the surface again. If we could only get a handle on this one concept, we might actually be the key to understanding everything else that confounds us, and stave off any impending existential crises. This might explain why infinity is such an important concept not only in mathematics and science, but in philosophy and religion as well. Although we cannot fully grasp infinity, we can still understand what infinity might be like. Children begin talking about infinity at a surprisingly early age, often by the time they are four or five. When my own sons were little, we would talk about infinity at home, but when I searched for picture books on this topic, I came up with nothing. Although these children were thinking of infinity primarily as a mathematical concept, I wanted to make sure that my story didn’t focus only on math, since infinity is first and foremost an idea. Rather, I decided to present different ways in which we can envision infinity, and then chart the emotional journey of my protagonist, Uma, who is trying to imagine this concept for herself. 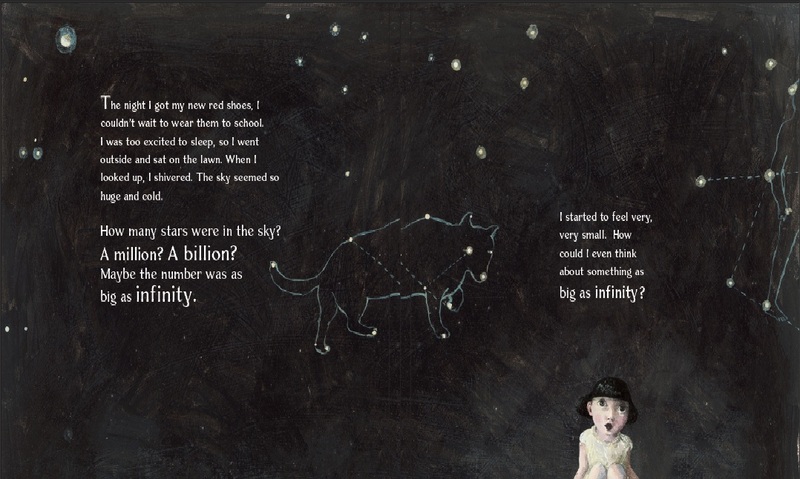 Infinity and Me begins with Uma looking up at the night sky and feeling overwhelmed by the infinite size of the universe. She decides to ask other people how they imagine infinity. 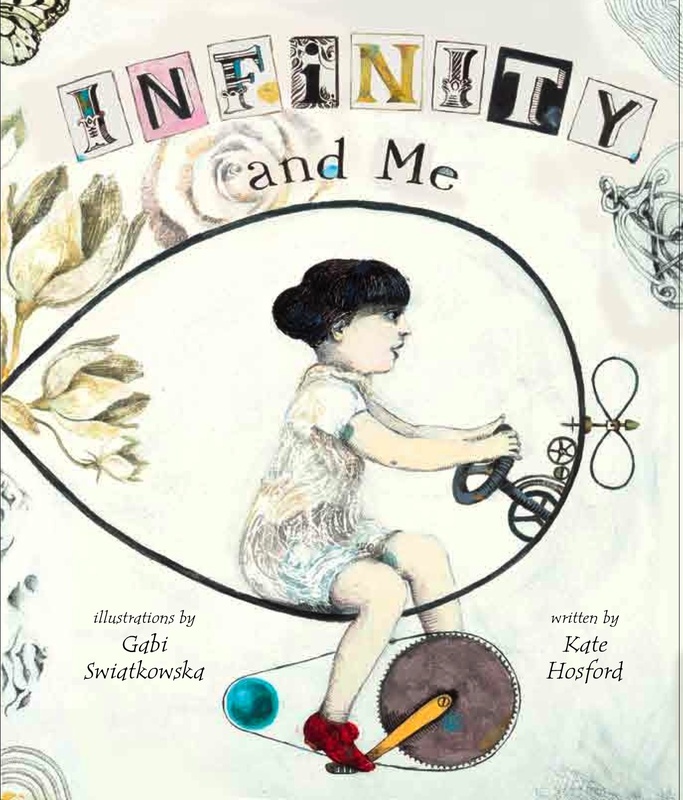 Friends, family and teachers provide her with various options: perhaps infinity is an endless number, or a car that goes around a racetrack forever, or a family that continues for endless generations. Perhaps it is a circular song without beginning or end. Uma continues to collect ideas until she comes up with an infinite vision that resonates with her. I hope that children will find it comforting to see that there are an infinite number of right ways to imagine infinity. Here are some visions of infinity from a group of third graders whom I visited at the School for Inspired Teaching in Washington D.C. In fact, every audience I have encountered has come up with absolutely wonderful ways to imagine infinity. I am currently collecting these quotations and posting them on my website. I also have an infinity curriculum on my site that teachers and parents can use: http://khosford.com/curriculum/ Please write to me at http://khosford.com/contact/and tell me how the children in your life define or envision infinity, or which of these curriculum activities you enjoyed. I have been very gratified by the response to Infinity and Me. There is, indeed, a place in the world for a picture book on this topic. I hope my book will help spur many conversations about infinity in homes, classrooms, and in the ever-expanding cyber universe. Kate Hosford worked as a social worker, an elementary school teacher, and an illustrator before becoming an author. 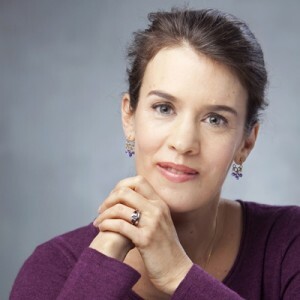 She presently lives in Brooklyn, New York with her husband and two sons. Her books are Big Bouffant, its sequel, Big Birthday, and Infinity and Me. You can find her online at http://khosford.com and on Twitter as @khosford_author. I love and appreciate this book so much, Kate. As a gifted teacher, I think the idea of infinity is one that is particularly important to my population of students. I didn’t realize you had a whole curriculum – I’ll have to take a look at that and see how I can incorporate it into what I do. I used your book in connection with reading and discussing The Phantom Tollbooth with third graders and it was wonderful! This is wonderful, Kate! What a wonderful idea and book. Can’t wait to read it. 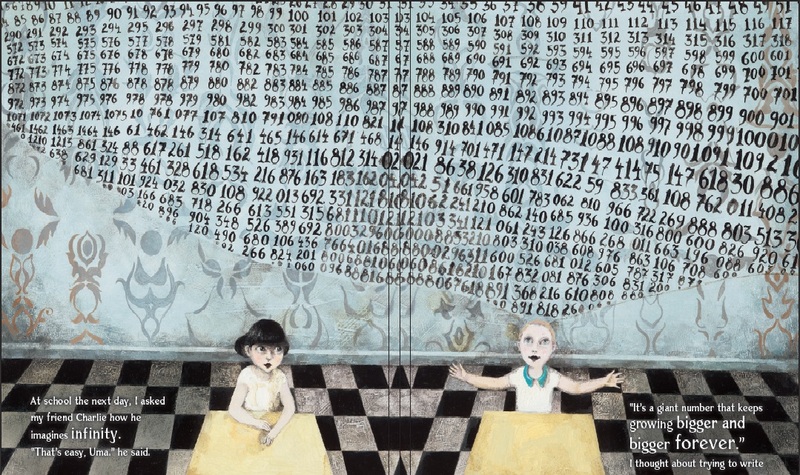 Another lovely book about infinity is called The Cat in Numberland. Thank you so much for this wonderful book. I have found children to be very curious about the idea of infinity and can remember my own son telling me when he was little that he “loved me infinity”. I haven’t read it to my class of second graders yet because I knew I needed to do some type of follow-up. Your curriculum tie-ins are just what I need. Thanks so much, all of you, for taking the time to read this post. I think the book can be used for a wide range of ages, especially in conjunction with the curriculum guide on my website. If any of you have trouble opening the curriculum guide on my website, just let me know and I will send you a copy. I love the idea of pairing this book with the Phantom Tollbooth. What a compliment!